Patrick Reed entered Sunday’s final round at Doral with a two-shot lead and he never gave it up, eventually winning by one shot for his third PGA Tour win. To be honest, not a whole lot happened all day on Sunday as Reed was just playing steady golf and the guys who were making moves up the leaderboard were just too far back to make much of a run. The players that were closest to Reed at the beginning of the day, big names like Tiger Woods, Dustin Johnson, Hunter Mahan and Jason Dufner all struggled at points and in the case of Tiger, never seemed to get it going at all. Reed didn’t make too many mistakes, and the few times that he did, he was able to scramble and get out of any real danger, until Reed got to the 16th. Carrying a two shot lead, and with Jamie Donaldson on the 17th green with a tap-in for birdie to get within one, Reed decided to layup on the drivable 15th and found the fairway bunker. Once again though, Reed was able to get out of trouble with a great approach into the green. From there, Reed got to the 18th with a two-shot lead and decided to go with the layup from the tee. He only needed a bogey to win by one, and that’s exactly what happened, getting the one-shot victory over Donaldson and Bubba Watson. Man, the praise for Patrick Reed was substantial on Sunday’s NBC broadcast, and to be honest, he deserves every bit of it. This performance was impressive from start to finish for Reed, who will move into the top-20 in the Official World Golf Rankings and it gives him his third PGA Tour win, all coming in the last 18 months and this is by far the biggest of the three. At 23, he’s one of the rising stars on the PGA Tour and you’d have to think that if he doesn’t qualify on his own, that Tom Watson will definitely place him in the mix for a captain’s pick at the Ryder Cup in September. Obviously Sunday wasn’t a banner day for Tiger, and we saw more issues with his back pretty early in the round after a bunker shot where he had an awkward stance. He was taking next week off anyway, so he’ll have a full week to recover before he presumably defends his title at Bay Hill, but as many people have said already, you never know with a back problem. Is it possible that we don’t see him at Bay Hill? I doubt it, but I guess it really all depends on how he’s feeling and he’s always going to have an eye out for Augusta. It’s not time to panic by any means, and it is still early in the season, but the back problem is starting to become cause for concern at this point. 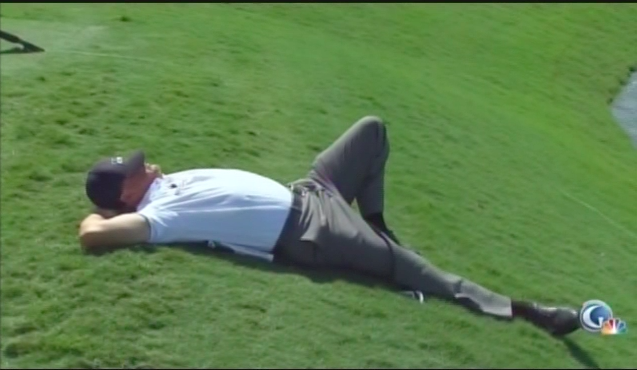 He looked geriatric at points on Sunday, especially when trying to grab the ball out of the hole, and I agree completely with Johnny Miller in that he probably just needs some rest at this point. We’ll just have to wait and see what happens in the next few weeks. There was a lot of talk before the tournament started about the changes that Donald Trump and Gil Hanse made to the look and feel of Doral, and I think they succeeded for the most part. Yeah, Friday was pretty brutal out there, but most of that had to do with the wind, which they have no control over and the firm greens will soften with time. The water was brought back into play and the once difficult course that had turned pretty easy in recent years was restored to a tough track with plenty of teeth. Tweaks are needed and will be made by Hanse and his crew, but that was going to happen regardless of what the reviews were this week. Thumbs up from me. It’s been a little while since I’ve used this header, and this time, it’s not even Miller who said the dumbest thing this week. That honour instead goes to his NBC colleague Gary Koch, who was a little miffed at Jamie Donaldson’s decision to layup on the drivable par-4 16th on Sunday when he was only down three shots. Donaldson hit iron into the fairway, got onto the green and two-putted for his par, but Koch was of the opinion that Donaldson should have attempted to drive the green. This is a perfectly legitimate criticism, and to be honest, I completely agree with him, but what he said after was what has him in this post. Hey, Jamie: the golf gods hate cowards. Chesson Hadley won the opposite field event this week in Puerto Rico for his first PGA Tour win. Quick note on the Ian Poulter/Hideki Matsuyama thing: Poulter probably made too much of the whole thing, but let’s not forget that what Matsuyama did, while likely not causing a crater like Poulter suggested, never should have happened. If you create a divot like that on the green, repair it. Don’t make an official do it. It’ll be a good GIFs of the week post tomorrow.